Ednaswap Is `Torn' Over Song's Success The California Group Wrote It; Natalie Imbruglia's Cover Has Made It A Hit. LOS ANGELES — There was no escaping the song - not in the car, not even at the beach. The words belonged to Anne Preven and Scott Cutler of the band Ednaswap, but the ``Torn'' earning saturation airplay on pop radio was strangely foreign. It sounded little like the torrid rock song about a failed relationship that Ednaswap played night after night on the road. That's because the voice and face on MTV belonged to Australian singer Natalie Imbruglia, whose pop hit has propelled her album Left of the Middle to sales of more than four million copies since March. This wasn't the first raid on the Ednaswap songbook: Madonna recorded the band's ``Sanctuary'' in 1994. But it was different with ``Torn,'' a tune that could now be heard almost anytime, anywhere. Not that she's complaining exactly. As she sat with Cutler in a North Hollywood cafe, Preven noted that the Imbruglia hit had earned Ednaswap's original version some airplay on modern-rock radio. But the band has yet to have any direct communication with the singer. 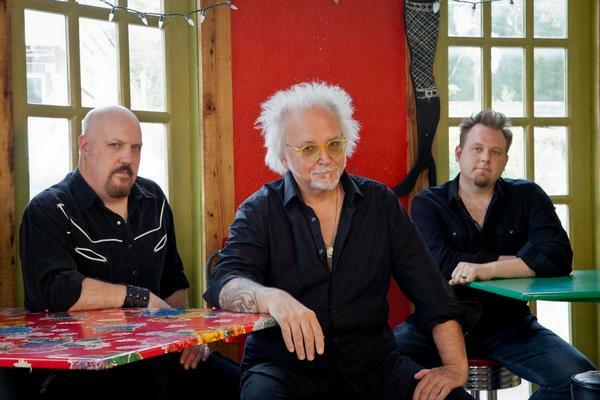 Reeves Gabrels, long-time artistic partner of David Bowie and The Cure’s current lead guitarist, brings his power trio, Reeves Gabrels & His Imaginary Fr13nds, from Nashville to England to play in small venues starting on September 30. Lovers of superb songs, stellar musicianship and fearless improvisation will all want to see and hear Reeves & friends in action. The band’s live sets will preview songs from their forthcoming album, also titled Reeves Gabrels & His Imaginary Fr13nds, which is to be released digitally just as they head home, on October 13. Highlights include the biting “Drown You Out” and the spooky “House of Usher” (titled after an Edgar Allan Poe story from an 1840 collection Tales of the Grotesque and Arabesque). Uncommon interpretations of Bo Diddley’s early rocker “Who Do You Love” and Jimmy Reed’s blues “Bright Lights, Big City” also feature. Album details and pre-order links will be available on the date of the first performance, September 30. Fans of earlier Reeves Gabrels albums will also be well pleased at the performances, as the trio will play songs from Sacred Squall of Now (1995), Ulysses (1999) and Rockonica (2005). And of course selected co-writes—Tin Machine’s "Bus Stop" (DavidBowie/Reeves Gabrels) and "Yesterday's Gone" (Reeves Gabrels/RobertSmith)—will be a treat for English audiences. Tickets are priced £10 to £14 (subject to booking fee) / London £16 (subject to bookingfee). Tickets are available from local box offices and above links. Just received a message to say the Birmingham date was incorrect and is actually Thurs 9th. First post updated to show this. Looks like quite intimate venues which is nice to see. well it's pretty appropriate venues for a band like that. Definitely more of a niche sound for guitar nerds MUCH different than what he plays w/ the Cure. When I saw them in Nashville this summer, there were maaaaaaybe 25 people in the room. And the US ahem. The BF would like this too. This is his kind of stuff. Good luck to Reeves and his mates. But that means no CURE plans until the very end of this year after the Riot festivals. I am wondering if Robert would join Reeves to sing Yesterday´s Gone, that would be awesome. I don't know about that... When I first heard that Reeves was going to be touring the UK for 2 weeks, my first thought was "he's got Cure plans in October and is going over a little early to do some shows before they start"
Well, we´ll see what happen in the next couple of months. Reeves isn't sitting around waiting for Robert to do something new. He has his own projects. Good for him. Here are 3 pictures from tonight to keep you going. I will upload more from my camera and Yesterday's Gone, tomorrow. Not sure why my photos didn't attach. Will post my ones from my camera instead soon.